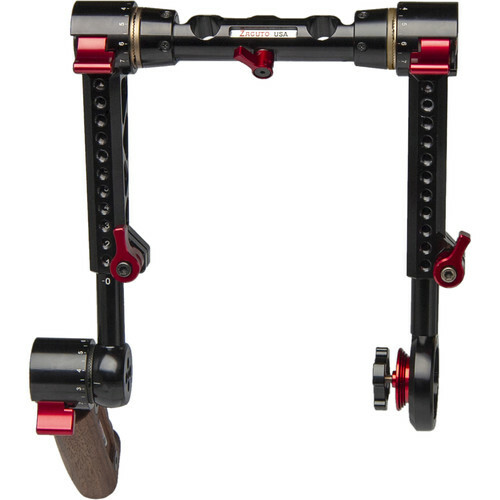 The Sony FS5 / FS5 MK II Dual Trigger Grips from Zacuto are a 15mm LWS rod mount handgrip set featuring one wooden handgrip and one grip relocator for the Sony FS5 and FS5 MK II camera grips. Each can be individually rotated a full 360° at the press a dedicated lever — there is no need to screw or unscrew any knob or lever but rather just press it on the fly. Furthermore, the wooden component of the wooden handgrip can also be adjusted forward and backward at the press of another lever, and same goes for your camera grip once you attach it. Box Dimensions (LxWxH) 11.35 x 9.4 x 3.05"